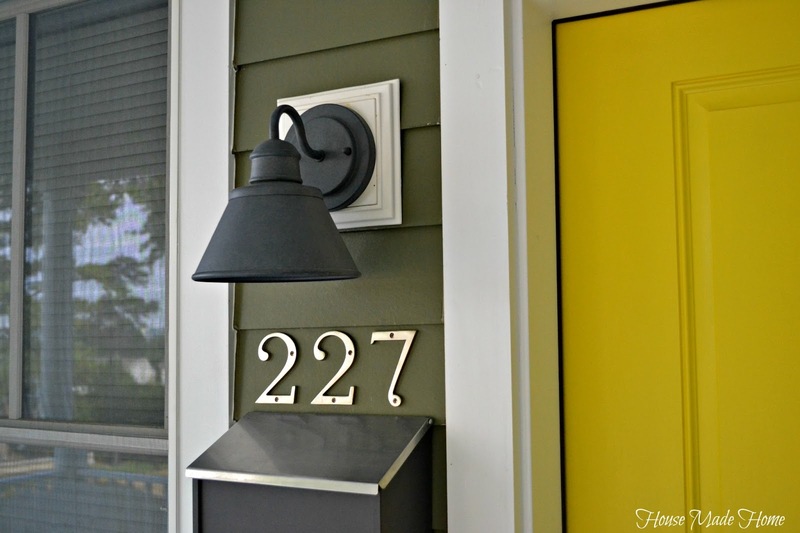 I've been wanting to update our porch light for a while now, but I was looking for something that was the right style for our house and in the right price point. All it took was a little browsing over at Home Depot before I found something that caught my eye. I decided to go with Hampton Bay's Outdoor Wall Lantern and for just a little over $20....it was mine! I love when I spend less than I originally expected because we can put that extra money toward the other projects that we want to tackle. 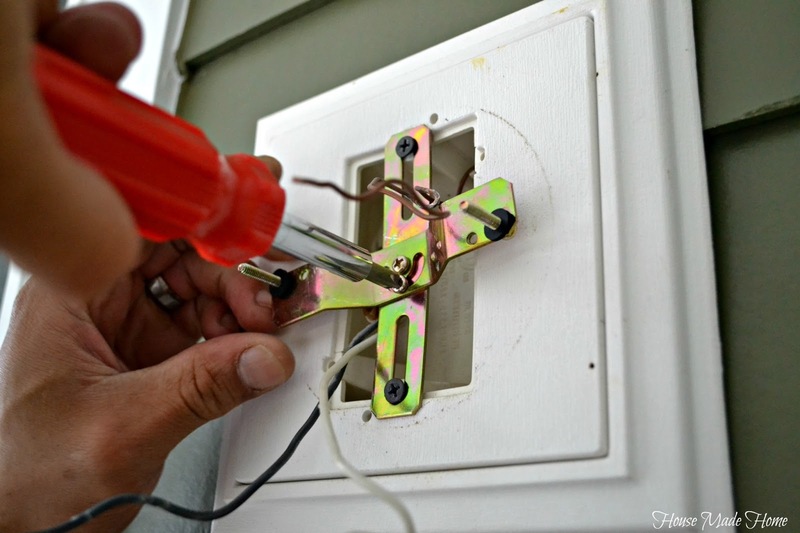 Any time that you decide to tackle an electrical project you want to make sure to cut off any breakers that are powering the area that you are working in. 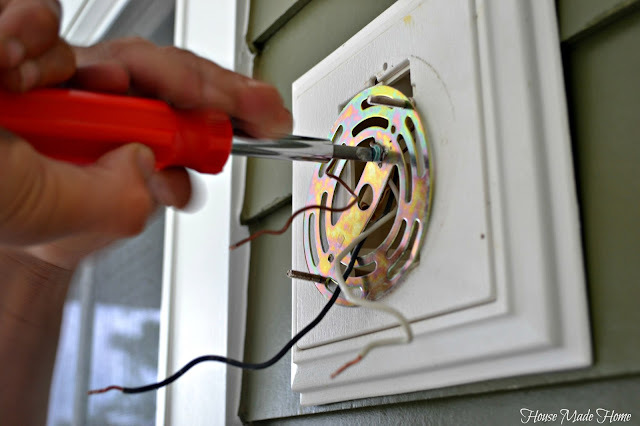 My husband doesn't want me to upstage him mess with anything electrical in the house so I had to wait on him to remove the light fixture and replace the existing bracket with the new one that came with our fixture. Easy peasy! The install only took about 10 minutes and I was in love with the style of the fixture, but I wanted a galvanized look so I made another trip to Home Depot. 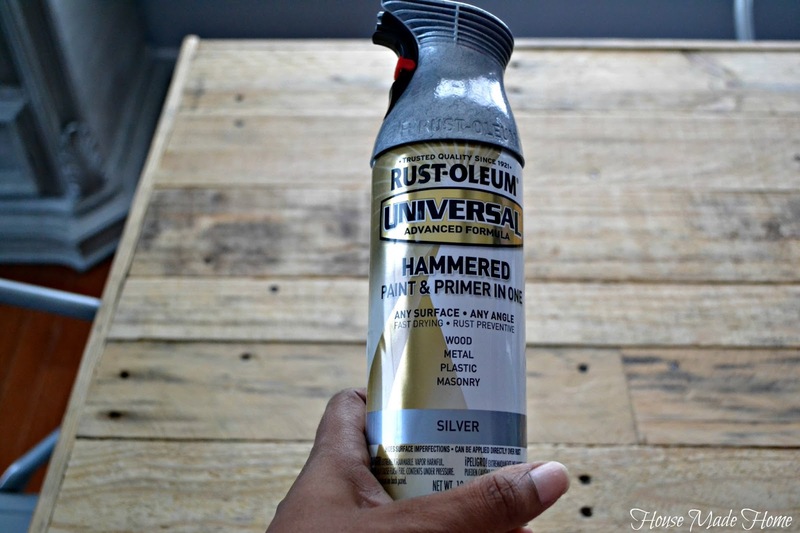 I chose Rust-Oleum Hammered in silver and was hoping that it would turn out the way I pictured it in my head. Everything is better in your head...now in reality it tends to be a little different. Skip the cheap stuff and splurge on the $5-7 quality stuff. Always keep the can moving. Keep the nozzle about 8-10″ away from whatever you’re spray painting. Always apply thin mists of spray paint, applying heavy coats makes everything wet and drippy. 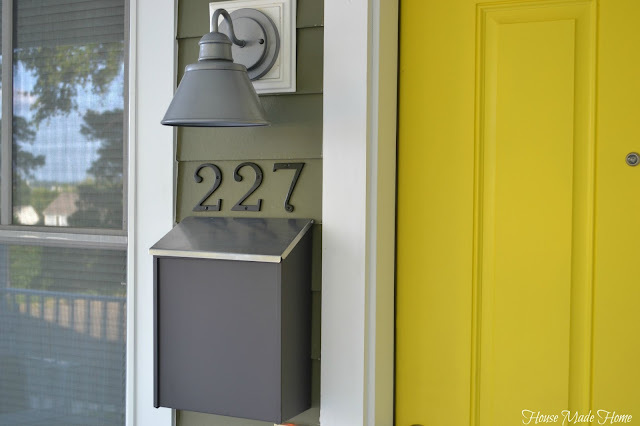 We plan on putting house numbers in a different spot for them to stand out more. What do you think? Anyway back to the task at hand. Here is the final product! A "beachy" fixture with a semi-galvanized look, new house numbers (one step on my next project complete), and I even changed our mailbox from brown to a charcoal by simply removing the cover panel. This looks SO much better! And actually, your version looks much more like the Home Depot photo than what you actually got originally. I love how this turned out! Love that light! 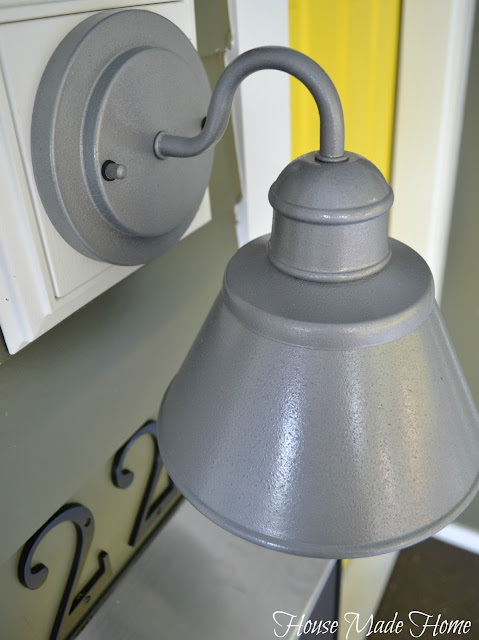 It's just what I've been looking for to use in my craft room...yep an outdoor light in my craft room. I'm checking out home depot online as I type! 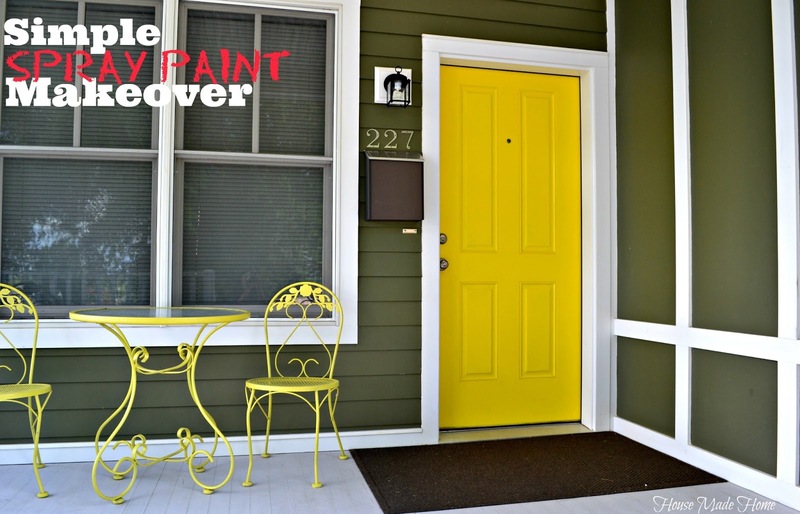 Your front porch looks awesome! Thank you for sharing it at What We Accomplished Wednesdays. Have a great week! Thanks Deborah! I've also thought about using these indoors...great look and price - you can't beat it!